Book your 2020 Discovery Cove Ultimate Swim Package and save up to £200 for a family of four with our fantastic early booking offer. To take advantage of these savings you must hurry and book before April 30th 2019. Remember this price also includes 14 days of consecutive admission to SeaWorld, Aquatica and Busch Gardens PLUS unlimited free parking. What’s included in your day at Discovery Cove? All tickets provide unlimited admission for 14 consecutive days from first use, with the exception of Discovery Cove which is a one day experience. 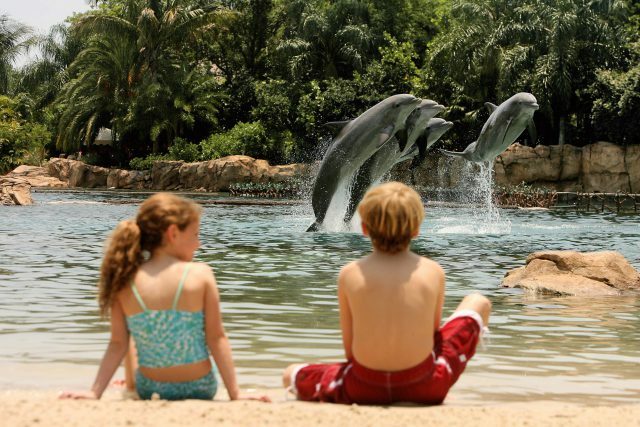 Guests must be at least 6 years of age to swim with the dolphins at Discovery Cove. Guests aged 6-12 must be accompanied by a paying adult who is also participating in the dolphin swim experience. Discovery Cove guests aged 3-5 must purchase the non-dolphin swim package. Free bus transportation is available to Busch Gardens on the Busch Gardens Shuttle Express. Unlimited free parking at SeaWorld, Aquatica and Busch Gardens is only available when purchasing the Discovery Cove Ultimate Package. Unlimited free parking is only valid for the duration of your ticket. This offer can be withdrawn or changed at any time. Children 0-2 years of age are free of charge. The Discovery Cove 2020 early booking offer is available on new reservations for Discovery Cove Ultimate Swim packages only and must be booked by April 30th 2019. The offer is available for visits throughout 2020 and subject to availability. The saving of up to £200 per family of four and 20% is based on visits to the park 16th March – 5th April, 14th – 16th April, 30th May – 7th June and 24th August – 31st August 2020. Prices shown on our Book Tickets page are reflective of the savings. Prices and savings will vary depending on the date of visit and are subject to change.